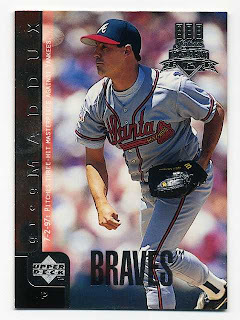 I know this is about a week late, but Greg Maddux might have been the most amazing pitcher I have ever seen in person. He did not have a blazing fastball, although this fastball was probably slightly above average. He did not have a curve that made your knees buckle. Instead he used knowledge of the game and the situation at the current time of the game and combined that with an amazing ability to locate pitches wherever he wanted to win 355 games and post some of the most incredible ERA's ever (as compared to the league average of those given years). Even in his 23rd season at the age of 42 he still put up respectable numbers (4.22 ERA and 1.20 WHIP). He probably could pitch a few more years if he wanted to, but instead we will see Mr. Maddux in Cooperstown, NY five years from now.